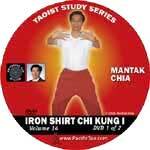 Iron Shirt Chi Kung is an ancient practice of internal energy training. Originally used by martial artists for inner power, this practice spread to become part of Medical Chi Kung because of its ability to awaken healing energy. The strength and vitality of your internal organs are the real keys to the overall health of your body. In this practice of strengthening the internal organs, Master Chia guides you through certain standing postures, muscle locks, and breathing techniques, known as Iron Shirt Chi Kung. These practices direct internal power to the organs, the twelve tendon channels, and the connective tissues fascia. By directing more energy into your internal organs you can perfect your body, increase performance, fight disease, and lay the groundwork for higher spiritual work. The standing postures teach how to connect the internal structure (bones, muscles, tendons and fascia) with the ground, so that rooting power is developed. By following along with the detailed instruction that Master Chia presents on this DVD, you will learn how to draw and circulate energy through the body. 9 MP3 files plus one MP3 playlist file, packaged in a single zip file.